Recently, well actually about 60 days ago, the owners of Puffape sent me one of their new carbon fiber DX80 box mods (Thank you Ivan) at no charge for the purpose of review. The device arrived about two weeks after shipping and was well packaged. Once the outer shipping container was opened, I found the DX80 fitted in its own consumer packaging along with a small screwdriver, a standard USB charging cable, a very well written and easy to read instruction manual and to my surprise a standard 510/eGo thread adapter. 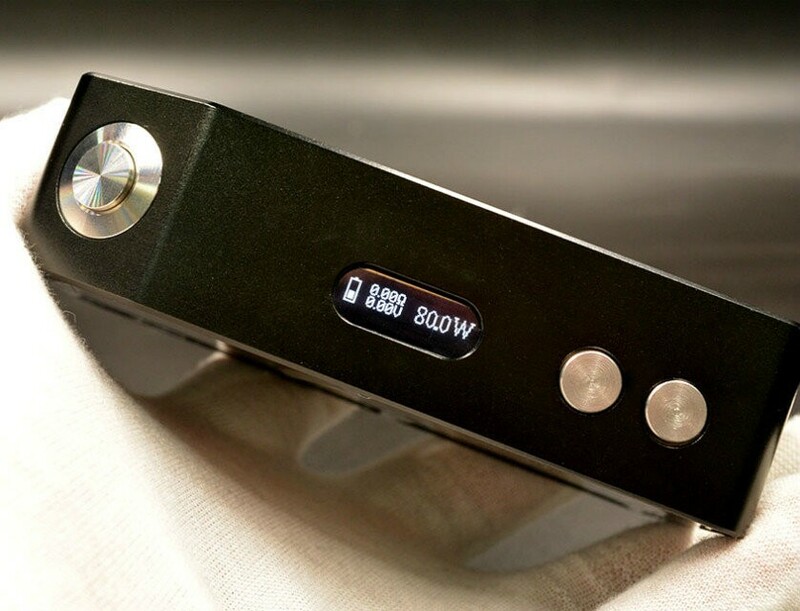 The mod itself is a well constructed out of a lightweight aluminum alloy housing with carbon fiber sides and contain the regulated digital switch mode DC to DC electronics and is powered by two 18650 batteries seated in what I consider a very high quality battery sled well marked with the +/- positions and wired in parallel. The output of the device ranges from 7 to 13 watts and 6 to 13 volts in 0.1 watt increments and a resistance range of 0.30 to 2.0 Ohms. The 510 connector has an adjustable center pin (hence the included screwdriver) and seems to be very well sealed with deep air channels which will direct any leaks away from the connector. On one carbon fiber side is the door to the battery compartment which is held in place by some seriously powerful magnets and I do mean POWERFUL. Every time I place it on my workbench where I form my coil and wick assemblies for my rebuildable atomizers, it always picks up any stray bits and pieces of Kanthal wire that are in the area. And if it comes in contact with the base of my work light it becomes firmly attached as well. Basically, the battery door is in no danger of coming off until you remove it yourself. The other carbon fiber side has the micro USB port for the internal charger. More on that in a bit. And speaking of the carbon fiber used in the construction, it seems to me that it is very high quality and is not at all prone to scratching and is what I would refer to as a “semi non-slip” finish. And when you look at it under the light, it has most definite 3D pattern to it which I quite like. The power button is at the top of the device set into a 45 degree angle. While this may seem strange to you as it did to me at first, it makes the device easy and somewhat intuitive to activate with either your index finger or your thumb whatever your preference may be. The button itself slightly protrudes from the housing and is easy to locate when you are not looking at the device and has a firm feel to it. On the front of the device under the power button, you will see the familiar placement of the screen and power adjustment buttons which have a very firm feel to them and have a nice “Click” to them which you can hear as you adjust the power up and down . The screen itself is a very bright .69″ OLED screen which is easy to read even in bright sunlight. The display (which I very much like) can be customised for your preferences of Left or Right, Stealth and can be easily locked and it displays your battery status, resistance of your atomizer (to the second decimal place), the volts being used as well as your power setting. 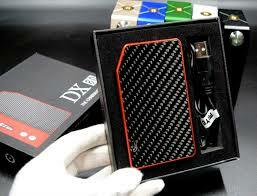 The device also has a wide range of protective and warning features. Check Atomizer, Check Battery, Weak Battery, Ohms Too Low, Ohms Too High, Too Low Power Alarm, Reverse Polarity and Short Circuit Protection. It also has a sleep mode which it will enter into after 30 seconds of non use. However, the power comes back immediately when you go to vape it again. And the device seems to use zero power while in the sleep mode. The internal charger works very well but like most of the ones on the market is rather anemic taking about 5 hours to charge a pair of 2500 mAh batteries. One thing I like very much about the the charging function of this device is that while you are charging it, the battery display is active and flashing while it shows you the current level of battery charge. And it stops flashing when the battery gauge shows “Full”. When I went to look up the dimensions of this device from the website, this is what I found. 102.8mm tall X 57.45mm deep X 26.3mm thick. Somehow it did not look quite right so I measured it myself. Anyway, the point I am trying to make is that in the hand it feels just a bit “Fat” and the corners of the device kind of dig into my hand a bit if I try to wrap my hand AROUND the device. However, if I hold it with the back against the HEEL of my hand and my fingers on the front, then it becomes very comfortable to hold. That being said, that while this device is portable and will fit comfortably into my pocket, it is an ABSOLUTELY PERFECT device for toppers over the standard 22mm diameter and is ideal for use at your desk or the table beside your comfy chair as with the larger footprint the device offers, it is just not going to fall over easily. At this point, I have been using this device for about 60 days now. It works perfectly and all features work as specified. In my opinion the build quality is flawless with no excess glue showing or any other defect either operationally or cosmetically. The only change I would suggest for the next generation would be to make the device a bit thinner and round the edges. But then again, most box mods need to have their edges rounded a bit anyway to be fair. One other piece of information that I have to offer. At one point I asked Ivan who’s chip they were using to drive the device, he shared with me that the chip was of their own design and had not yet been named. But then again as long as it functions like it does, it really doesn’t need a name.